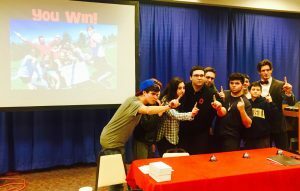 Our standard event features a team-based quiz contest, built on the bar-trivia model but expanded into a multimedia, TV-style game show that everyone gets to play. Our professional quizmaster presents the questions verbally and via video/audio, and teams collaborate to guess the answers (submitting them with our easy-to-use digital system). Innovative formats and sound effects add to the big-time fun. Depending on the occasion and the location, we can vary the format; let us know about your event and we’ll design the ideal trivia game to suit your needs. Watch our latest promo video here. 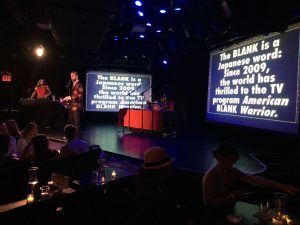 We have no fixed location—we’re traveling entertainers who can stage our event in almost any space—but the Big Quiz Thing has talented staff in New York City, San Francisco, Boston, and Chicago. Plus, we’ve presented quiz shows throughout the country. Our typical events take place in the client’s home or office, or a private space in a restaurant, bar, or event venue. (We’re happy to make recommendations.) We can entertain wherever you are, or wherever you want to be. Q: How is it different from a bar trivia or pub quiz event? 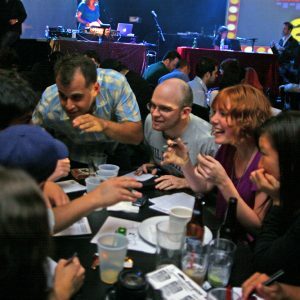 Unlike the typical quiz game you’d find at your local bar, the Big Quiz Thing is a fully produced, TV-game-show style spectacular, featuring multimedia content and unique formats, specially designed to entertain and engage audiences far beyond the typical trivia geek. Moreover, our original trivia questions and puzzles—expertly crafted by some of the country’s best trivia writers—are what we describe as “figureoutable”: They rely more on a creative, collaborative thinking process, rather than “you either know it or you don’t” questions. Q: What topics do you feature? Every event is customized, but we favor a mixed bag of American culture (pop and otherwise). Want us to specialize in a particular topic? Let us know and we’ll make it so. Indicate that we should keep it clean and everything will be family-friendly (kids are some of our favorite audiences). Have a guest of honor? Our team can personally confer with friends and family to design a game all about their likes and dislikes—and, if you want, their life and times. Q: Who hosts the events? Our events are run by dynamic professional quizmasters—not just dudes with microphones reading a list of questions. They know just how to maximize the fun for you and your crowd. We pack a lot of high-class fun into a portable package, so our events typically require only a basic A/V setup, Wi-Fi (for our digital answer system), and some tables and chairs—we can work with less if necessary, or bring in equipment. Q: Do you give away prizes? 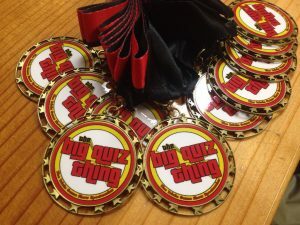 Every member of the winning team receives a deluxe Big Quiz Thing Victory Medal, to cherish always. Want to up the stakes? We can work with you to provide extra prizes—gift cards, gag presents, even an office perk. Let’s discuss. Q: So what does it cost? Since our events are custom-designed, our fee depends on various factors, including the number of guests and location. Please e-mail or call for a personal consultation (and so we can answer all your questions that we couldn’t possibly anticipate here). Click the link below so we can get started making your next event the supreme quiz experience.